There are some very good, talented teachers out there. They love what they do. They will try hard to impart knowledge to their pupils. They are happy to learn from their pupils – education is a dialogue for them – and they also enjoy working with pupils on an individual basis. However, there are some poor teachers out there too. They have no love for what they do. Education is a one- way process and if you find you can’t grasp what is being taught that is your tough luck. These teachers treat what they do as a job and nothing else. There is no calling. They get no joy out of it – the joy of making people understand, the joy of dialogue and debate, the joy of mental stimulation. So how can ICT in the classroom help safeguard against these teachers? Well, ICT is making learning more pupil / learner centred so there is less need for the old pedagogic, one way system, a system which suits the bad teacher. Tablets and iPads allow for interactive learning. The pupil constructs knowledge out of the encounter between what he already knows and fresh input. This is a more enlightened, optimistic approach to learning that understands if the pupil is left to his own devices (forgive the pun) he will learn. 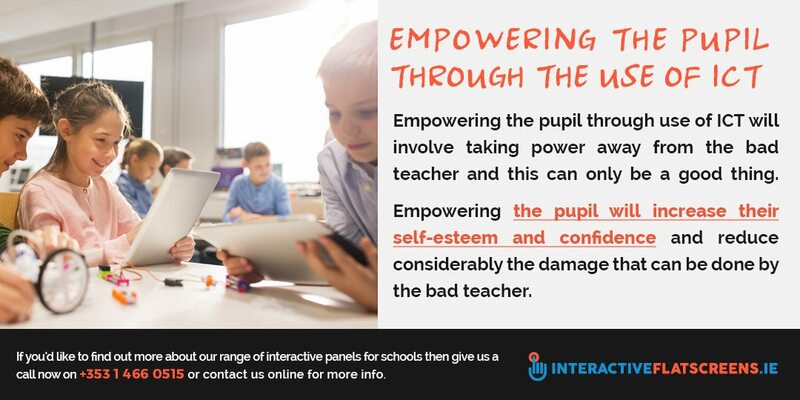 Empowering the pupil through use of ICT will involve taking power away from the bad teacher and this can only be a good thing. Many bad teachers have a kind of contempt for their pupils which is often rooted in class prejudice and snobbery. Empowering the pupil will increase their self-esteem and confidence and reduce considerably the damage that can be done by the bad teacher. Learning through ICT will engender in the pupil a faith in the education system which he will take with him into college and when he goes out into the world. It will make him feel valued. A bad teacher will leave pupils feeling weary and distrustful about ‘the system’. If the teacher doesn’t care about them then the system doesn’t. ICT such as tablets, iPads and interactive panels enrich the learning process and make it more satisfying and rewarding for the pupil. ICT doesn’t discriminate. Whatever your background or socio-economic status, the tablet will treat you as an individual. 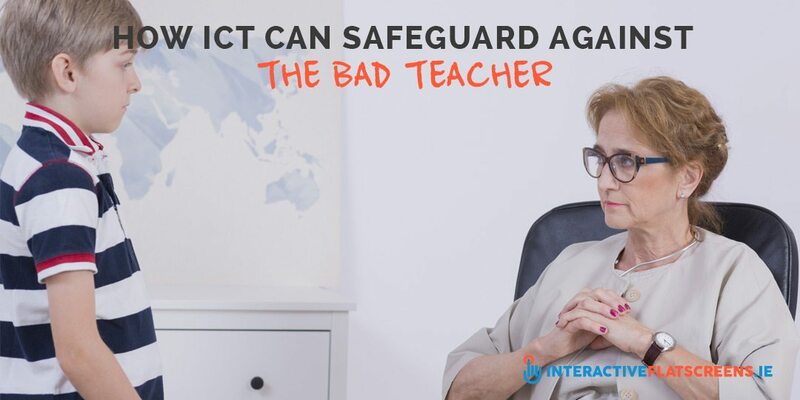 So, the damage done by bad teachers is lessened to a considerable degree through use of ICT in the classroom. The future of education looks bright. 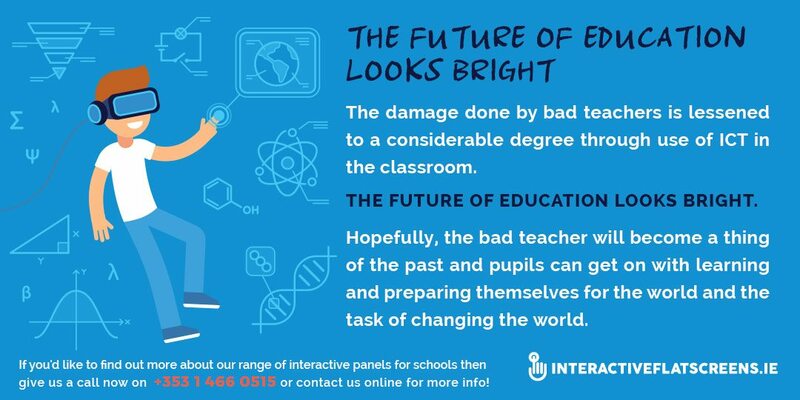 Hopefully, the bad teacher will become a thing of the past and pupils can get on with learning and preparing themselves for the world and the task of changing the world. If you’d like to find out more about our range of interactive panels for schools then give us a call now on +353 1 466 0515 or contact us online for more info!